Blue Forest were delighted to work with Marion Mako in the design and planning of one of our latest treehouse projects. Marion (www.makogardens.co.uk) is a freelance historic garden and landscape historian and designer. Just like Blue Forest, Marion believes that in this ever changing world it is essential to take time out and re-connect with nature. Gardens do not, and should not stand still in time and therefore it is essential to document these spaces to ensure there is always a resource for restoration, recreation or simply posterity. With this in mind she helped us put together a Brief History of The Treehouse, which we wanted to share with you all. There has been evidence of treehouses used for habitation for thousands of years, as a way of living above inhospitable ground. In parts of Asia, this style of dwelling is still popular in areas where flooding is a potential threat. People use a pulley system to raise themselves and their belongings up to the canopy, which in turn provides shade in a hot climate. There have four distinctly fashionable periods for building treehouses: Roman era, Renaissance period, the late eighteenth century Romantic period and the early twenty first century. The first recorded evidence of treehouses used for recreation dates from the first century AD. During the Roman era Pliny the Elder described one made for Caligula in a Plane tree at Velitrae. This was of the platform style, but others were enclosed in the trunks of trees. Renaissance Italy saw a resurgence of their popularity due to the description in the Francesco Colonna’s immensely popular book Hypnerotomachia Poliphili (1499). The powerful Medici family also incorporated them into their gardens near Fiesole and Pratolino, thus setting a new trend. Other treehouses were used for dining or listening to music. In a landscape it was important to have focal points and resting places dotted around to provide a resting place and different viewpoint. One of the earliest of these at Pishobury was drawn by John Drapentier and recorded in Henry Chauncey’s book The historical antiquities of Hertfordshire (1700). 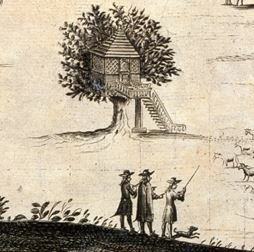 As a location for pleasure treehouses because very popular in the nineteenth century. Just outside of Paris, in the suburb of Plessy Robinson, large Chestnut trees, intertwined with rambling roses, were used to create restaurants within the trees. At the height of their popularity, up 200 diners were accommodated in the treehouses, with the food and drink being winched up in baskets. 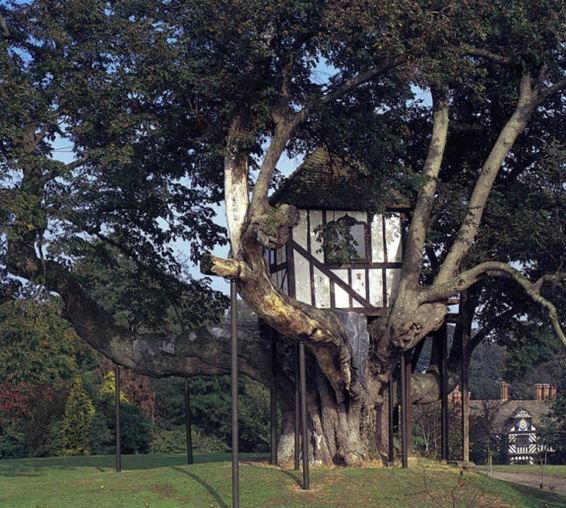 In 1902 the architect Harold Peto designed and built a treehouse for Daisy, Countess of Warwick at Easton Lodge, Essex. This was restored in 2009. The evidence of historic treehouses is scant, due to their ephemeral nature. Always made from wood, they were unlikely to have a life of more than around fifty years. However the oldest surviving example is thought to be that of Pitchford Hall in Shropshire. Probably dating from the early 17th century, it was remodelled in the eighteenth century when the ogee windows and gothic interior were added to accommodate the changing taste, when garden buildings were influenced by styles from all over the world. Today there is a resurgence of interest in treehouses. The fashion for using locally sourced materials along with technological advances means that more complex structures are possible, such as the complex at Alnwick Castle. As with historic garden buildings, imagination is key to the creation of these unusual structures. If you are planning on building a tree house you should be aware that it will require planning permission. It is also important to consider the impact the building will have on the health of the host tree. Blue Forest have built hundreds of treehouses and have developed specialist techniques for their construction which limit the negative impact on the surrounding flora and fauna. Our team have lots of experience in obtaining planning permission and can manage the process right through from design to construction. Please Contact Us to find out more and get the process started. Paula Henderson & Adam Mornement, Treehouses, 2005, p.12. (Pliny, Natural History, Book XII, Ch.V). Celia Fiennes, The Journeys of Celia Fiennes, (1685 – 1703), 1983. p.140. David Leviatin, “On the up: countess Daisy’s lofty gem reborn”, Cornerstone, Vol. 30, No. 2, 2009 p.70 – 71.